I have been an avid birdwatcher for years and I am always on the lookout for new and interesting bird books in the library’s collection, so I was excited to see this on the library’s new book shelf. This book is unique in that it shows what happens when real birds get angry. Birds are grouped into four levels of angry behavior: annoyed, testy, outraged and furious. Each level presents snapshots of a wide variety of birds, which include a photo of the bird, a helpful “rap sheet” of useful facts about the bird that includes its species, physical description, known whereabouts, aliases, and a very brief description of its angry behaviors along with a one-page summary of the bird and its angry behavior. I found a few of these birds and their behaviors to be quite common, like the Northern Cardinal fighting its reflection in a car window. But most were new to me and I think they will be new to most readers here in the United States. I especially enjoyed reading about the following birds. The Fieldfare is one of the annoyed birds. It is a medium-sized songbird from Europe that groups together for protection—when a larger bird like a raven encroaches on their territory, the alarm call is given, and a flock of fieldfares will mob the intruder and shower it with a burst of their collective poop. This is not just nasty but can prevent the intruder from flying and staying warm, and can even lead to death. The Masked Lapwing is a testy bird that looks like a character from a Stars Wars movie. It likes to hang out in open spaces like golf courses and playgrounds. It screams at any people who get too close, and it will not hesitate to use the sharp spurs on it wings, which like a pocket knife can inflict painful wounds on any intruders. My favorite bird is the Northern Fulmar, an outraged bird from the Arctic regions that protects itself in a unique way, by vomiting a noxious stomach oil onto its predators (or victims). This particularly nasty oil, which is based on their diet of seafood that includes fish and shrimp, can cause death to other birds and some rodents, but can also be used as an emergency source of nourishment for the Fulmar if the bird is unable to hunt for food. I think the photo of a baby Northern Fulmar engaging in this behavior is particularly amusing. Interspersed among the snapshots of these real angry birds are two other features. The first is a series of short feathered facts about birds getting angry and taking action. The second feature is a description of several of the major birds from the mega-hit Angry Birds game, including Terence, Chuck, Matilda and Red. Each bird gets a background story, a description of what makes them mad and a rap sheet much like the real angry birds, all of which can help you better appreciate the game. This book would definitely appeal to younger readers with the tie-in to the popular Angry Birds game. But the interesting stories, high-quality photographs, and well-organized content make this a must-read for anyone interested in birds. Highly recommended. Here’s a blast from the 1980s past, combined with a futuristic dystopia in a novel that’s just plain fun. 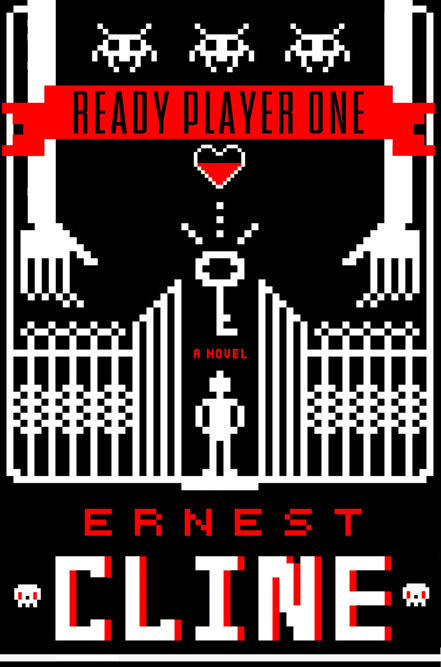 Ernest Cline’s debut novel Ready Player One is set in a future where fuel shortages, wars, and corporate destruction have made real life miserable. The protagonist is Wade Watts, an Oklahoma City teenager whose real life is relentlessly grim. But like most of the other people in 2044, Wade stays positive by spending most of his time controlling his avatar in a virtual world, OASIS, a world of worlds where players can have almost any experience imaginable. The OASIS was programmed by a brilliant but somewhat cracked man: James Halliday made a huge fortune from his brainchild, and on his death announced that he had hidden an easter egg in the game. The player who finds will claim his fortune and his company. As the novel opens, three years have passed, and none of the easter egg hunters (or “gunthers” as they’ve come to be known) has succeeded in solving even the first level of Halliday’s puzzle. All that changes when Wade passes the first gate and sees his avatar’s name at the top of a high score list. This makes him the envy not only of regular gunthers, but of a sinister corporation that wants to find the easter egg so it can take over OASIS and turn it into a source of income. Dozens of their employees cheat by playing as a team, ganging up on the other virtual players, and when they can find their real life identities, sometimes attacking in the real world. Wade works to solve the other puzzles and finds friendship and romance (albeit virtual) with other players, but at the same time, he becomes a target, both in real life and the game. What makes Cline’s book distinctive is its homage to 1980s geek culture. Halliday was in love with that culture, so the OASIS, the gunthers, and the puzzles on the way to the easter egg are all dependent on 80s films, books, role playing games, comics, and music. If you like computer gaming of any kind or 80s culture, I suspect that you’ll have a blast with this quick reading science fiction adventure novel. OK, so zombies are big these days. Huge, in fact. Fictional and historical characters have taken up the eternal battle against the undead with great success. But what if you were a 20-something slacker and the Day dawned? Shaun is the classic underachiever. In fact, the greatest triumph of his life is probably living away from his mom and despised stepfather. He’s in a dead-end job (and all his younger co-workers openly laugh at him), he’s drifting through a relationship with girlfriend Liz, and he’s stuck between his hard-charging roommate Pete and doper/gamer Ed, his best friend and the third roomie in the flat. When Liz dumps him, Shaun decides to change his ways. Unfortunately (fortunately? ), the zombie outbreak has preceded Shaun’s resolution, and Shaun is forced to make more drastic changes than even he had imagined. The script does a great job balancing the horror of increasing zombie attacks and the humor of Shaun’s attempts to be a hero. The funniest part of the film (to me) was a scene in which Shaun goes out to run an errand and blithely walks past scenes of mayhem. But he quickly comes to understand that he’s surrounded by a catastrophe and begins to improvise weapons in the face of zombie attacks. (Another funny scene has Ed and Shaun arguing over which sentimental objects are OK to use in their battles.) But that humor is underlined with background images that leave the viewer uncertain and off-balance—is that a couple kissing in the shadows of a phone booth, or a hickey going drastically wrong? Are those kids playing tag or is It one of Them? Shaun of the Dead occupies an enviably unique spot in the movie realm: a horror film that is truly comic, a comic film that is truly horrific. There are moments of revelation as well, including impossible decisions that Shaun and his friends must make to survive. I don’t know that you could truly say that Shaun grows up, but at least he finds his niche, no matter how bizarre that niche may be. Do you think there is too much development in your town? Are traffic jams giving you a headache? Do you miss the forests and trees that used to be everywhere? 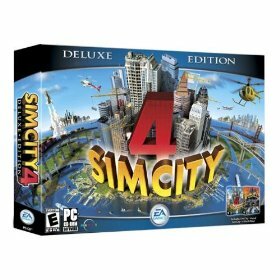 If you answered “YES” to any of these questions, and if you feel YOU could do a better job at running things, then here is your chance to strike back, at least in a virtual environment, with the Sim City 4 Deluxe edition. It won’t take long for you to get hooked on the vast array of service and building options that you can employ in building your perfect city. But it won’t be a walk in the park. Before you know it, if you are not careful, your Sims (as the locals are called in the game) will be screaming at you, trash and pollution will pile up everywhere, your coffers will run dry and your Sims will give you the boot and you will have to start all over again …. if you dare. In this review I would like to provide some tips on creating a successful Sim city and highlight some of the cool features that you can use to keep your Sims as healthy and as happy as you want them to be. First, decide what kind of city or town that you want to build. SC4 supports a wide range of city types and geographic features, from mega-cities to farm, beach and mountain towns. With the SC4 region view, where multiple regions are interconnected, you can experiment with different city types. You can use the “God-mode” to alter the geographic features you want your city to have before you actually build it. You can add lakes, rivers, beaches, mountains — whatever you want your city to have. But be sure to put in what you want here, because it will cost you later once your city is in place. Second, you need to start your city. You can choose to start at three levels of income — in debt, $100,000, or $500,000. I recommend the $500K level for beginners. You need to select a power source, which is usually a coal burning plant, which is cheap and efficient but is also a big polluter, so place it on the edge on the map. Choose a few low density zones for your start-up, mostly residential and industrial with a few commercial. As your city starts to develop, gradually increase the density of all 3 zone types to bring more Sims and jobs into your area. Third, you will need to provide a variety of services to keep your Sims healthy and happy. This includes power, water, roads, schools, hospitals, fire and police stations and most importantly (ahem) LIBRARIES — lots of them. They don’t cost very much and they add greatly to the well-being of your Sims. In “Mayor Mode” you can keep track of the services that your Sims need while you build your city. These services are the most expensive to you when you are in the beginning stages of your city. Start small and don’t provide a service until it is absolutely needed by your Sims. Fourth, as mayor (and part dictator) of your city, you control the tax rates, and you can adjust these rates to pay for services and manage the growth of your city. The taxes on the three zone types (residential, commercial and industrial) are managed separately. As your city grows, the demand for the various zoning types should also grow. When that happens, you can gradually raise taxes to bring in money that can then be used to provide a greater range of service that your Sims will need. Fifth, sometimes you cannot please all of the Sims all of the time. You may need to cut back on health care or educational services to bring your coffers out of the red or make your budget more robust. My schools and health clinics were often overcrowded to the point that the workers went on strike. When that happened, and after I made sure that my Mayoral rating wasn’t hurt too much, I enjoyed zooming in on these buildings and watching my little worker Sims striking. After a while, if it got really bad, I would either increase funding or build another clinic or school, which would keep them happy for a very short time. Sixth, there are tons of cool features that make this game fun to play. You can engage in neighbor deals and buy or sell services like water, power and waste disposal when you build several interconnecting cities. In mayor mode, you can pull up a service grid on your city that can help you identify problems in your city like traffic congestion and crime. There are lots of reward buildings you can place in your city once its gets to a certain level. Finally, once you’ve spent hours building up your city of ungrateful Sims, there are all kinds of ways that you can have fun destroying it, from tsunamis, volcanoes, UFO’s and even meteor attacks.